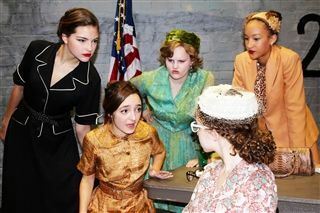 Louisville High School Louisville’s 12 Angry Women Hits The Stage! Louisville’s 12 Angry Women Hits The Stage! Look out Louisville because there are 12 Angry Women on campus! On October 20th –22nd, thirteen talented Louisville Royals and an unstoppable team of understudies and stage crew brought a 1957 classic back to life with their production of 12 Angry Women. From the beautiful 1950s costumes and acting, to the lighting, sound, and set design, 12 Angry Women surely did not disappoint. Based on Reginald Rose’s 12 Angry Men, adapted into a drama/crime film in 1957, 12 Angry Women is the intriguing story of a jury deliberating the fate of a 19-year old boy accused of murdering his father. The jurors walk in with the expectation of an open and shut case until one inquisitive juror, brilliantly portrayed by Hanna Lerner '18, starts to question the jurors, revealing insight into each juror’s character and turning them all into 12 Angry Women. As the curtains close on this year’s Fall Drama, the Louisville students have inspired our community to dare to share our talents and express our own, unique, creativity. Thank you to everyone involved in 12 Angry Women for inspiring Louisville to "Dare to!"